Today we meet Ruggero Boselli, president of the Rinascente dairy in Bagnolo Mella, set in the Brescia plains, a totally flat land bordered to the east and west by the Chiese and Oglio rivers, to the north by pre-Alpine moraine hills, and to the south by the outer edges of the provinces of Cremona and Mantua. The traditional local dishes here include polenta and meat on the spit, and casoncelli: pasta pockets stuffed with meat or vegetables, served with a generous sprinkling of grated Grana Padano! The Rinascente dairy is a cooperative, established in 1966 by 13 farmers who joined forces and decided to use their milk to produce Provolone and, later, Grana Padano. In the early years, there were 45 dairy farms supplying the milk for the cheese, but as time went on, many of the farms closed down and only the most advanced and efficiently organized among them survived: today the cooperative has 12 members who supply milk to the dairy to turn it into Grana Padano. The milk comes from producers located within 3 km of the cheese factory, and from dairy farms with animal welfare certification. Production takes place 7 days a week, and the cheese-making process, which starts at 5 in the morning, is in the capable hands of the head cheesemaker. 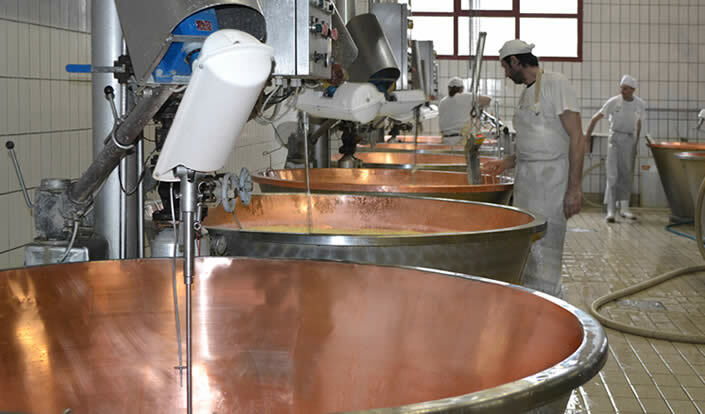 Ruggero has been a member of the board of the Grana Padano Protection Consortium for several years and is satisfied with the work done, which resulted in Grana Padano being exported and turned into the world’s most popular PDO product, giving the sector the opportunity to grow. previous: Soc. Agricola F.lli De Cao s.s.